Tilos is a beautiful small island of the Dodecanese lying between Rhodes and Kos with beautiful, sandy beaches and crystal-clear waters. It is an ideal holiday destination for those who want to experience the original and enjoy simplicity and relaxation, as well as those who love nature and are fond of trekking in nature paths. Eristos, Plaka, Livadia, Aghios Antonis. 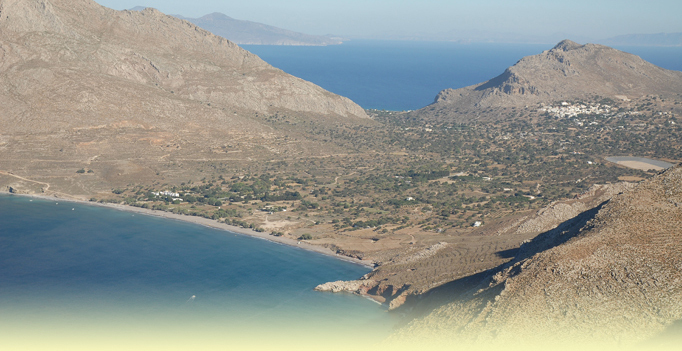 Beaches accessible by boat: Lethra, Skafi, Aghios Sergios, Theologos (trips to these beaches are organized). June 27th: Aghios Panteleimonas Fair (traditional food, folk music and dancing). July 28th: Koupa Festival (Archangel Michael Square,in Megalo Chorio). August 15th: Fair of Panaghia Theotokissa (Virgin Mary) in Mikro Chorio. Dwarf Elephants Museum in Megalo Chorio. The Castle of the Knights at the top of the hill of Megalo Chorio where you can enjoy the magnificent view below. The 1501-century Monastery of St. Panteleimonas. Harkadio Cave with findings from the paleontological age. The churches of Panagia Theotokissa (Virgin Mary) and Aghia Triada. You can reach the island by boat which departs from the port of Piraeus twice a week. He trip takes 16 hours. Alternatively, you can catch a boat from Rhodes which departs daily in the summer and takes 2-4 hours, depending on the type of boat. On the island you can rent a car, motorbike or bike.